﻿ Energy-saving brake roller ｜ASAHIKINZOKU Co.,Ltd. MBR (Mechanical Brake Roller) incorporates a speed controller which uses the centrifugal force generated in the arm as the gear amplifies roller rotation with load transportation. 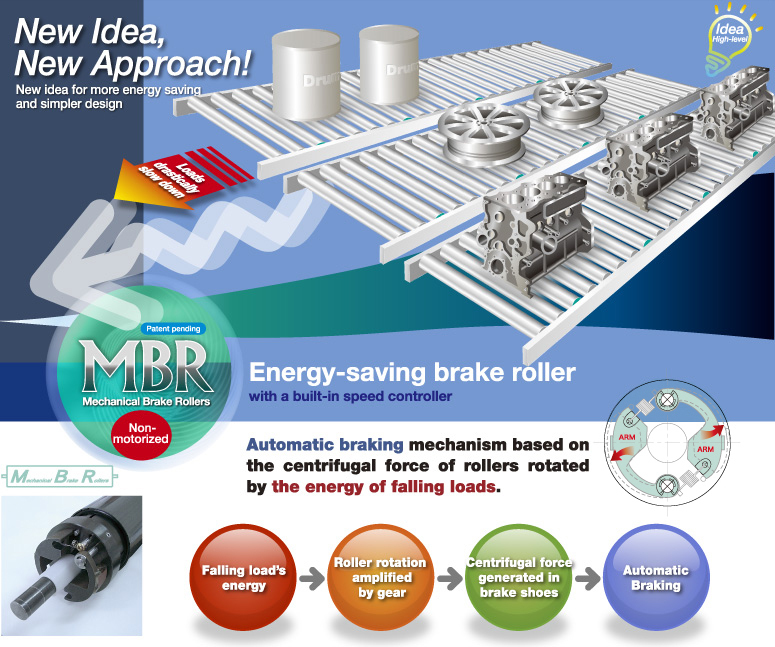 Using no power source and relying on the force of gravity, MBR is the ultimate energy-saving brake roller. This mechanism not only saves the operator’s labor but also allows the load to slow down gently without damage to it. MBR can be used for various purposes including low-speed conveyance or prevention of uncontrollable operation in self-propelled conveyors, and speed reduction before a turnaround or transfer machine. Use the special mounting bracket for a small-diameter roller. speed exceeds a given level. ● No need for an electric power source or air source. MBRs are used in a variety of situations. 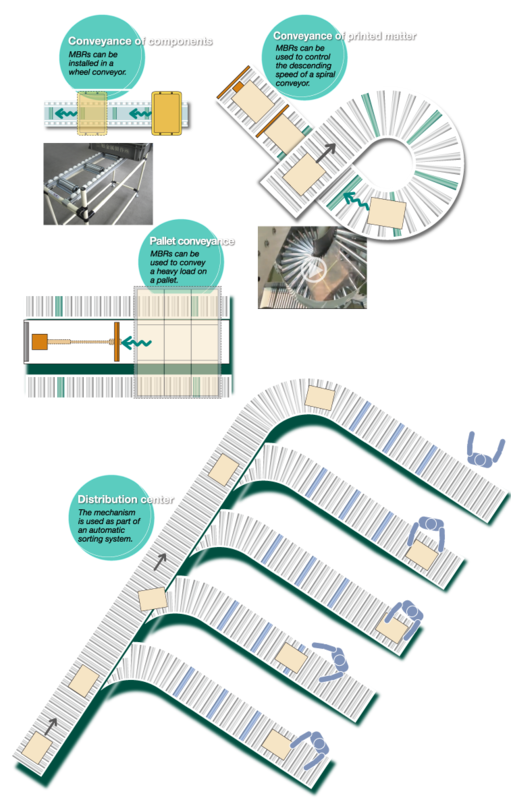 The system which combines MBRs with an automatic load separator assures higher efﬁciency. For roller widths less than 230 mm, consult us. Please select the roller whose withstand load is twice or three times the weight of the load, considering the surface condition of the load and an impact which may be generated when the load is placed on the conveyor. Note: MBRs should be used within a temperature range of -5 to 40˚C. For safe use, be sure to let us know if your initial operating conditions are changed. Handling caution:In order to avoid damage to the precision mechanism, take enough care not to drop or strike the MBR. Copyright ASAHI KINZOKU Co.,Ltd. All rights reserved.